Regalado’s interest in the American Japanese communities can be traced back to his WSU days when a professor assigned Roger Daniels’s book Concentration Camps USA: Japanese Americans and World War II and to his own friendship with a Japanese neighbor. In the early 1990s, Regalado began to branch out from his main research in Latino baseball and added baseball in Japanese American communities. 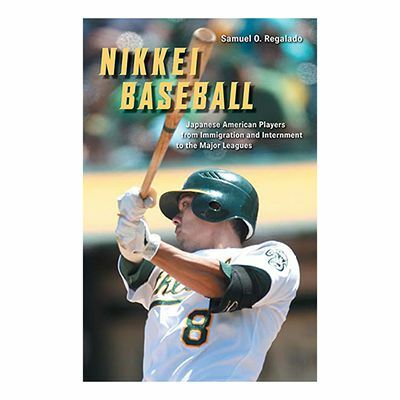 Nikkei Baseball is a result of over 20 years of his research and scholarship. Nikkei Baseball follows the American national pastime from its introduction in Japan in the late 1800s to Hawaii and the West Coast where most of the early immigrants and their children had settled, to the present day. In this journey, the love of baseball by early Japanese migrants and their descendants “uncovers a unique and rewarding feature of the American past, and one that profiles a people who turned to the national pastime for respite during their darkest moments,” writes Regalado. The author traces the history of baseball in Japan and provides an excellent contextual analysis on Western (specifically American) influences in late nineteenth century Japan. Both Japanese reformers and American visitors promoted baseball as an important institution that would encourage “patriotism, industrial productivity, and modernization” in the Meiji Restoration. Some Japanese of the time (the first generation Issei, especially those in the rural areas) moved overseas because of the brighter economic opportunities in the West. Subsequent chapters discuss the lives of the Issei and their descendants, the Nisei, and how baseball became an integral part of the Japanese diaspora in America. A vibrant baseball culture existed from major cities such as San Francisco and Seattle to smaller Japanese migrant enclaves in Hood River, Oregon, and the Yamato Colony in central California. Readers see the tribulations of community leaders who organized and promoted baseball clubs and then leagues. In large part, Issei and Nisei leaders saw baseball as a way to assimilate their communities into the mainstream and to preserve traditional Japanese values. Anti-Asian feelings, however, ran high from the late nineteenth to at least the first half of the twentieth centuries. Japanese communities (along with the Chinese) were always viewed with some degree of suspicion if not outright hostility. Despite their passion for the American pastime, de facto segregation was the rule of the day. Nikkei baseball was no exception to this exclusion as it received little coverage from the white media since competition was largely limited to the Japanese American communities. In addition to hostilities toward Asians, segregation led to one of the most tragic chapters of human and constitutional right violations in American history. When the United States entered the Second World War in 1941, the passion for and participation in baseball failed to avert the uprooting of the Japanese American communities and their incarceration in concentration camps. The national pastime did offer some degree of normalcy in otherwise extremely stressful and trying conditions as baseball began almost immediately in the camps. Regalado details the resourcefulness and enthusiasm of the internees to organize baseball competitions to make their predicament a little more tolerable and, of course, to demonstrate their loyalty toward America. For those who are interested in the intersection between sport and ethnicity, Nikkei Baseball should be a welcomed addition. Its impressive bibliography, both in the number and variety of sources, will help anyone who wants to know more about Japanese Americans and their history. For baseball aficionados, Nikkei Baseball resurrects characters and organizations that were part of the making of the national pastime. And sports trivia lovers will find amusing nuggets such as the story of games between Japanese American teams and a barnstorming team that included Babe Ruth and Lou Gehrig. John Wong is an associate professor of sport management at Washington State University.